Heritage Centre News and Updates - 2005. Thanks to the Town Council, who under the new licensing laws obtained a licence for the Verwood Christmas Extravaganza held on Saturday the 17th of December at the Heritage Centre and on Ferrett Green. The license covered both locations. During the evening the Verwood Rotary Clubs Father Christmas did his usual tour. The training band of Verwood Concert Brass played while the mulled wine or hot coffee and mince pies were thoroughly enjoyed. Local Mayors from the area at the Civic Function held in the Verwood Heathland Heritage Centre and the Memorial Hall on the 11th December 2005. December 8th :- The Twinning Sub Web includes the History of Twinning in Verwood now added to the site. December 4th :- Verwood Twinning Association trip to Germany. Verwood Mayor Mr Mike Daymond and Mr & Mrs Newman getting into the Christmas Spirit, manning Verwood's Stall at the Liederbach Christmas Market (in Germany) during the visit by Verwood Twinning. Select here for full report! November :- Further pages added which include Chronological list of events in Verwood and an additional section covering Reminiscences from "Old Verwoodians". These will be expanded as further issues come to light. 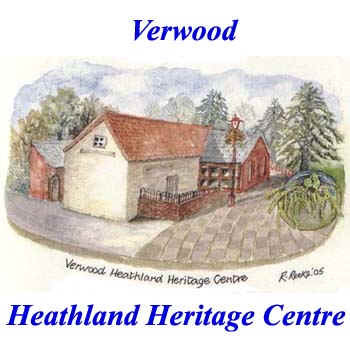 October 17th :- The Verwood Heathland Heritage Centre AGM, 07:30 p.m. at the Centre. Executive Council: - appointed members remain VHS, VTC, EDDC. Elected Members: - Chairman, Secretary, Treasurer and Archivist. Ex officio members: - Chairman, Secretary, Treasurer and Archivist. Elected Members: - up 4 friends' Association Members. Note the committee can co-opt up to 2 members from sub-committees. Subscriptions (£5) may be made after the meeting during Tea and Coffee. Select here for the latest newsletter from the Secretary. October 3rd :- The Heritage Centre opening hours changed - 09:30 a.m. to 12:00 p.m.
September 13th 2005 :- The new "Verwood Churches" Exhibition opens at the VHHC. Note that the last day to see the current "War Years" Exhibition will be on the 9th September. - please see the Exhibitions page. August :- It was announced that the Tapestry given to Verwood by its twinned French Town of Champtoceaux during the recent visit is to be framed and is displayed in the Heritage Centre along with the large pot gifted by Liederbach in Germany which already resides in the Heathland Heritage Centre. August :- In her newsletter to the "Friends of the Heritage Centre", the Secretary says that due to the centres success the "merry band of volunteers" needs additional members/stewards, not only in the Coffee Shop but also covering the Museum/Exhibition Hall because on many days it is no longer possible for Coffee Shop volunteers to cover this area which leaves the Museum without a steward. If you are prepared to spare an hour or two as a steward then please contact the secretary, Ann Page. You do not need to know about Verwood's history or what all the Exhibitions are about, though it obviously helps if you are interested. June 13th:- The Official Opening of Phase two of the Verwood Heathland Heritage Centre by the Marques of Salisbury, PC, DL occurred. Select here for more information. May / June :- The unit is now nearing completion and the decorators moved in and have now finished painting the unit.